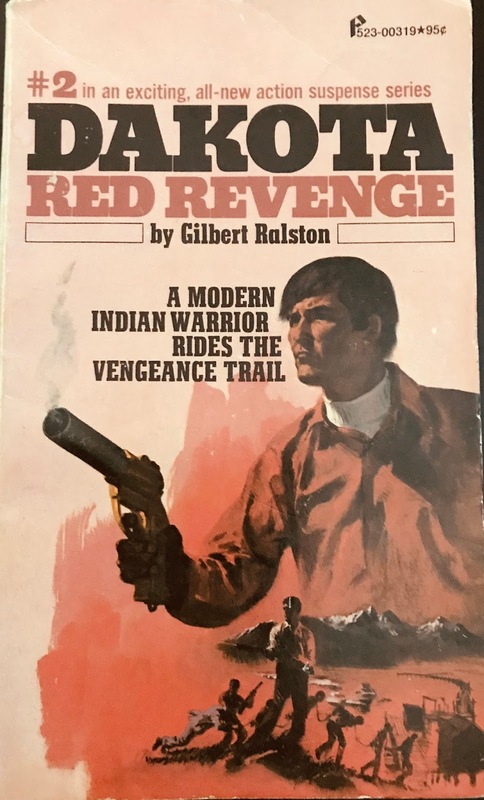 “Red Revenge” is another top-notch effort from author Gilbert Ralston. It was released in 1974 through the popular Pinnacle Adventure line and marks the second installment of modern western series 'Dakota'. 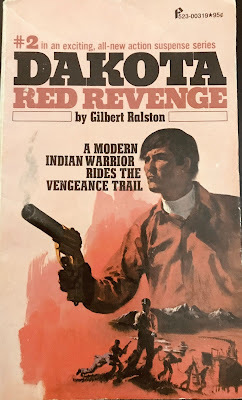 As I mentioned in my review of the series debut, “Dakota Warpath”, this character is strikingly similar to what Craig Johnson would do years later with his 'Longmire' character. This book mentions some of the events that transpired in the series opener. Ralston almost has a hometown feeling to the book, by outlining and describing all of the characters that make up this colorful Carson Valley town. Some were introduced in the prior book, some are new. Dakota has a love interest here named Alicia, and based on the book's ending she could be a recurring character throughout the series. The storyline of Dakota's sick father continues and concludes in this book. Also, the young Native American that Dakota assisted in the prior novel is a steadfast character here - sort of the action-assistant or inexperienced ally. Louis serves as a dialogue direction as Dakota explains to the reader what he's doing with the case. The Board of Directors of Grayson Electric have been kidnapped for ransom in Lake Tahoe. The employees' families reach out to Dakota to offer assistance. They need to pay three-million in bearer bonds to the kidnappers, or heads will roll. While they sort out the collateral, Dakota starts the search for where the men are being held. This is about half of the book and is a really entertaining nod to detective fiction – checking leads, interviewing potential witnesses, etc. Eventually, Dakota taps a location and loads the guns. Dakota, being Shoshone, has two blood brothers that join him for the rescue attempt. Ralston absolutely nails the liberation, from hunting and killing to an all-out assault. It's done remarkably well, and includes a fair amount of car run 'n gun and a robust body count. After the high-impact finale, Ralston doesn't just throw the sheets on the corpse. He lets us stick around for 20-more pages while the story is ironed out, bodies are named and Dakota himself explains his actions to law-enforcement. It's a unique angle that few authors rarely conceive and deliver. What happens when the smoke clears and the hero has killed the bad guys? It's not as black and white as the end credits make it seem. Ralston understands that and I applaud him for giving us a little more than standard volume feedback. Dakota hits the Big Apple next for “Cat Trap”.